Join the marvelous site of the Cambron abbey for a wonderful day surrounded by wild animals. The Cathedral Birdcage: the largest one in Europe. The Oasis is an animal safari in the subtropical immensity. The Nautilus: an incredible journey in the heart of the legendary submarine.. Madidi and Nossy Komba Islands: green paradise. Algoa Bay: the giant cliff. The Mersus Emergo: gigantic whaler sheltering a spectacular interactive exhibition, "S.O.S. Biodiversity". In the gardens, succumb to the charm of the queen of flowers, find the warmth of Southern Spain or escape yourself in the heart of the fabulous «Dream of China »… NEW IN 2006 The Dream of the emperor Han Wu Di (Chinese Gardens) The Raptors’ Village. 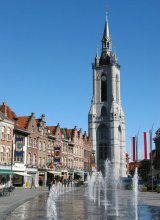 The Belfry: The oldest belfry of Belgium, UNESCO Mundial Heritage, opens all its rooms along the 257 steps. In one of them, a multimedia show recounts its history, linked to the City’s. One advice: start your visit by the “Couloir des Temps”, summarizing 200 years of Tournai’s history (Tourism Office), before going inside the belfry and watch the movie showing its history. 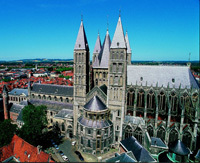 Notre-Dame Cathedral: The Cathedral is also part of the UNESCO Mundial Heritage. It’s one of the most beautiful religious buildings in the Occident. It does succeed to various churches which origins go back to the introduction of Christianity in our regions. Today’s edifice is made of a nave, a roman style transept, built in the 12th Century, and a gothic style chancel erected in the 13th Century. The crossing of the transept is overcome by five bell towers that gives the cathedral an incomparable majesty. The main façade is preceded by a porch from the 14th century decorated of sculptures from different times. 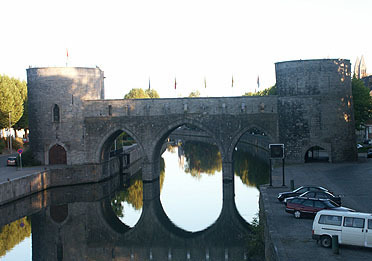 Le Pont des Trous: Le Pont des Trous (The Bridge of Holes) is one of the most prestigious relicts of the military architecture medieval of our country. It was part of the second communal walls, pierced of 18 doors, and was defending the course of the Escaut in its crossing through the city. La Maison du sucre (The Sugar House): La Maison du Sucre present and develop around fourty themes very diversified such as the historical aspects of the sugar, especially at the Napoleon’s times, and subjects more « peripherals »: a collection of sugar packages, sugar in the art and literature, evocation of cream pies in the burlesque movie, movie animation on the Traviata, table art, eccentricity of the guiness book of records, etc. Frasnes-Lez-Anvaing, a region to discover . Walking tour of the nature in Hacquegnies. Property of the Princess of Ligne, since the XIV century, the castle is entirely furnished and has a rich collection of art objects from the XV and XIX centuries, amongst them the famous library with 20,000 volumes. The French garden, harmonious alternation of water and green areas, of shades and lights, it extends over 25 hectares through which a small wagon could take you on a ride. Ski and snowboard center on real snow. - 2 slopes for new and confirmed skiers – free ski/snowboard, lessons in groups or privates, trainings for kids and adults - 2 Savoyards restaurants (450 and 200 places) with a panoramic view on the slope – mountain specialties + salty / sugary snacks. For 1 hour or 1 day of great sport, join us for a guaranteed wonderful time.